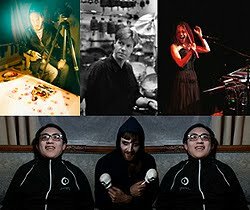 Outsound Presents, the home grown artist nonprofit collective of the Bay-Area returns July 18th - 24th for the 9th Annual Outsound New Music Summit, one of the most comprehensive experimental music festivals on the West Coast with another unique roster of talent. The festival seeks to build on its reputation for diverse and critically-acclaimed performances with headliners that run the gamut from the films of Martha Colburn, multi-phonic drummer Alex Cline, the siren voices of Amy X Neuburg to the unabashed performance noise of Chen Santa Maria. Every summer since 2002, the New Music Summit spends a week in July showcasing some of the most innovative and pioneering new music that is happening in California and beyond. At first a celebration of the eclectic vanguard artists on the DIY Edgetone Records Label, the Summit now features a broad range of artists from across the US, Europe, Australia and Japan. It features world premieres and exclusive debuts, raging free improvisers to microtonal composition to experimental electronics to harsh noise, reflecting an incredible range of genre busting exploration and sonic creativity. The Summit promotes intermedia, fostering cross-pollination between disciplines of music, sound art, visual and media arts. It is committed to bringing highly innovative music and art to a growing audience seeking a new experience. The 9th Annual Outsound New Music Summit takes place July 18th through the 24th at the San Francisco Community Music Center, the Summit’s home for the past three years. The festival schedule includes the much anticipated yearly Touch the Gear tm, a free hands-on expo Sunday July 18th where attendees can experience new sounds and the devices that make them. A build your own cardboard synthesizer (Skatchbox) demonstration Monday July 19th with grandmaster instrument builder Tom Nunn, pre-concert artist talks, and four nights of music featuring a diverse lineup of artists. The schedule includes a rare collaboration between Los Angeles iconoclast drummer Alex Cline and former Shadowfax ‘extended technique’ and ‘frequency manipulation’ guitarist G.E. Stinson. Performance vocal art by the Cornelius Cardew Choir, Amy X Neuburg, and “spoetry” (spam poetry) from Reconnaissance fly. The program also includes a full night of experimental films by musician conceptual artist Martha Colburn with music by pianist Thollem Mcdonas, and the internationally-exhibited 2009 60X60 Film Mix from Voxnovis featuring sixty local and international composers to film by Patrick Liddell in sixty minuets. The mission of Outsound Presents is to raise public awareness of avant-garde and experimental music and sound art. All events and works supported by the organization focus on the creation of experimental music, avant-garde musical composition, found sound, improvisation, creative music, new music, noise, musique concrète, minimalism, invented instruments, genre-bending music, and sound that is sculptural or textural in nature. Outsound Presents events also include film, dance, and intermedia works. Through its two year around music series, its fledgling community education program OutSpoken, and a palette of artist services, Outsound Presents connects audiences to new work and the innovative artists creating it. Experimental films by Martha Colburn, with a live score by Thollem Mcdonas. Also, the internationally- exhibited 2009 60X60 Film Mix from Voxnovis.com, featuring sixty local and international composers to sixty one-minute films by Patrick Liddell. a night of free improvisational music with Hunt/Allen/Orr (featuring Joshua Allen, Timothy Orr, & Randy Hunt). Also, Emily Hay /Motoko Honda duo - and to top it off, legendary drummer Alex Cline with guitarist G.E. Stinson. A night of performances infused by voice and performance art with Reconnaissance Fly, the Cornelius Cardew Choir, and Amy X Neuburg. A night of sculpted noise art with phog masheeen, Headboggle, Kadet Khune, and Chen Santa Maria.